Khloe Kardashian is the ultimate gym bunny. She seems to visit at least once a day and when she can’t attend she has a personal trainer to put her through her paces while she’s on holiday. There’s no rest for the wicked and that’s why Khloe’s managed to achieve such a ripped, toned body as well as lose a lot of weight over the past 12 months. If you want something, you have to work for it! However, there’s no reason why you have to dress down in the gym. Khloe looks just as fabulous while she’s working to achieve her figure as she does when she’s showing off the results afterwards. And the good news is we can all copy one of her recent gym outfits almost exactly. She’s wearing Nike Pro Engineered Giraffe Training Tights and you can get a pair that’s exactly the same as hers for just £39.99. 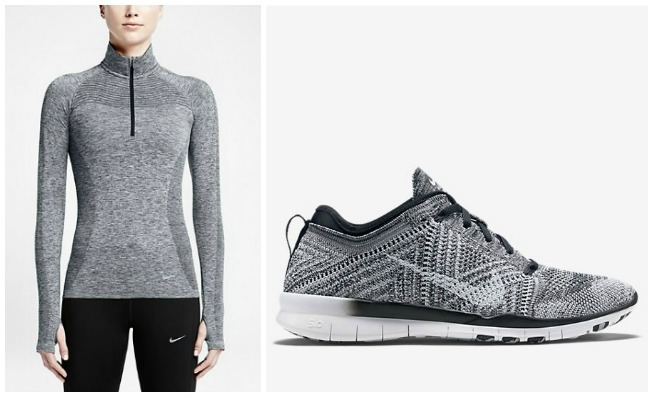 The top is the Nike dri-fit half knit zip and then the look is finished with the colour co-ordinated Nike Free TR 5 Flyknit trainers. Wearing something like this would inspire me to go to the gym more often, safe in the knowledge that I look hot while doing so. And if I end up with a figure like Khloe’s after then that would be a bonus. What do you think?